3 Times the Charm by Me and My Sister Designs makes you want to grab your favorite precut charm pack and whip up these easy to make fabulous colorful quilts. Enjoy 7 new patterns designs. Every pattern features vivid photos of 3 different colorways. You get a new look simply by the Charm Pack you select for each quilt. You can sew dozens of whimsical fabrics into one quilt top- in a single day. 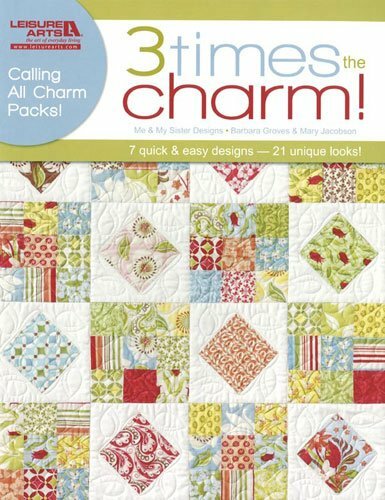 Barbara Groves and Mary Jacobson illustrates how to use Charm Packs of 5 inch squares from your fabric stash. What a bargain to get 7 patterns in 40 pages of easy to follow instructions in vivid colored illustrations all in one book.